While African-American Josephine Baker is generally considered to be the first widely-acclaimed black performer in Paris with her entry onto the stage in 1925 at the Théâtre des Champs-Elysées, another black artist, whose stage name was Chocolat, had already achieved celebrity status in the city some forty years before her arrival in the City of Light. Read about Chocolat in this month's Paris Insights. Late19th century Paris had many circuses, but the only one left standing today is the Winter Circus. Read about this magnificent structure in this month's Paris, Past and Present. Dining at Qui Plume la Lune, a restaurant located in the 11th arrondissement, is a unique experience – even an adventure! 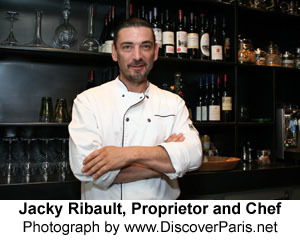 Read our review and meet chef and proprietor Jacky Ribault this month's Le Bon Goût.